With exhibits intriguingly entitled The Welsh Gallery, Old Schoolroom, Transports of Delight, and the Railway Room, as well as themed exhibits and a timeline of toys through the years, the West Wales Museum of Childhood is sure to delight. The museum has a rather appealing slogan; 'To everyone who is - or ever has been - a child'. And that tells the story; the museum is a trip down memory lane, reminding us all what it meant to be a child over the last 100 years. Chances are, you'll find yourself reminiscing about your own childhood, or telling children how much fun those 'old' toys were! The 5 main galleries hold a remarkable 10,000 artefacts, from dolls, toys, model cars and trains, toy soldiers, teddy bears, games, to pinball machines costumes, and household objects. The Welsh Gallery includes only toys made in Wales, with a costume display, a recreated Welsh cottage, and an old toy shop. The Gallery of Time displays old doll houses from as far back as 1927, and toy settings depicting the Swinging Sixties, Far Away Places, and a Day at the Beach. 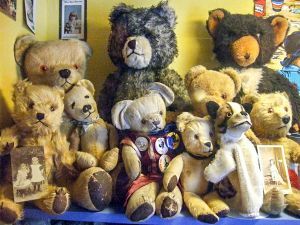 See a teddy bear's picnic and an exhibition of toys from the Coronation years. The Transports of Delight exhibition includes a period schoolroom with original Victorian desks from the school at Cenarth. See Dinky toys, a display of traditional British favourites, and toys from around the world. A Film and TV Gallery showcases toys covering some of our media favourites, from Dr Who to Star Trek. See Thunderbirds toys, Magic Roundabout memorabilia, Batman and Robin, and more favourite characters from film and television. The Llangeler Junction exhibit focusses on model railways (and some fun action figures). See OO Gauge railway displays, Hornby Dublo and O Gauge railway sets, and more O gauge railway objects. The museum is located at the Pen-ffynnon Farmstead, a 1795 farmhouse once owned by the Lewes family. The main exhibition area is set in a traditional 18th-century longhouse. Other exhibitions are located in the farmhouse stables, carthouse, Victorian kitchen, and barn. The museum is privately run and welcomes school groups and private parties. Open year-round, and there is an admission fee.